This Taco Crescent Bake is amazing! And, amazingly easy, too. Are you looking for easy dinner ideas that your entire family will go ga-ga for? This taco crescent bake is so good and everyone will devour it, from the spouse down to the five year old. 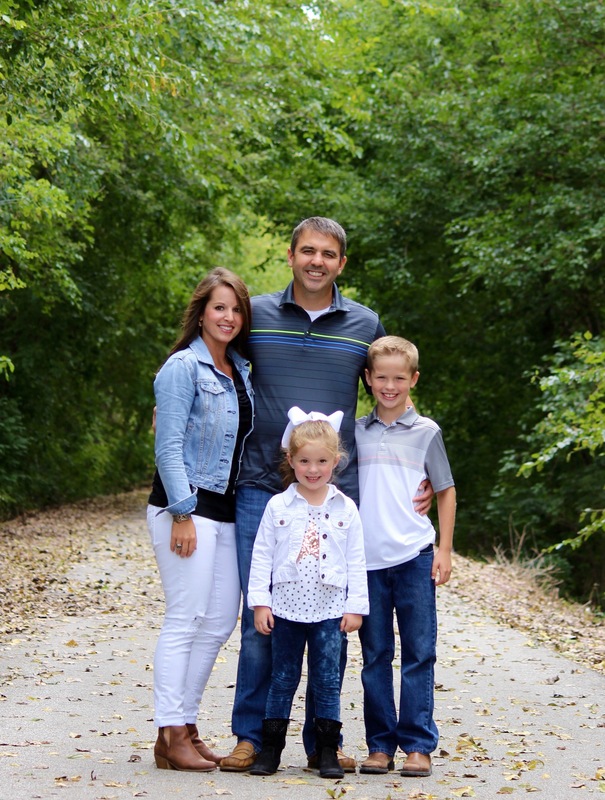 We recently had our daughter’s sixth birthday here at the house. 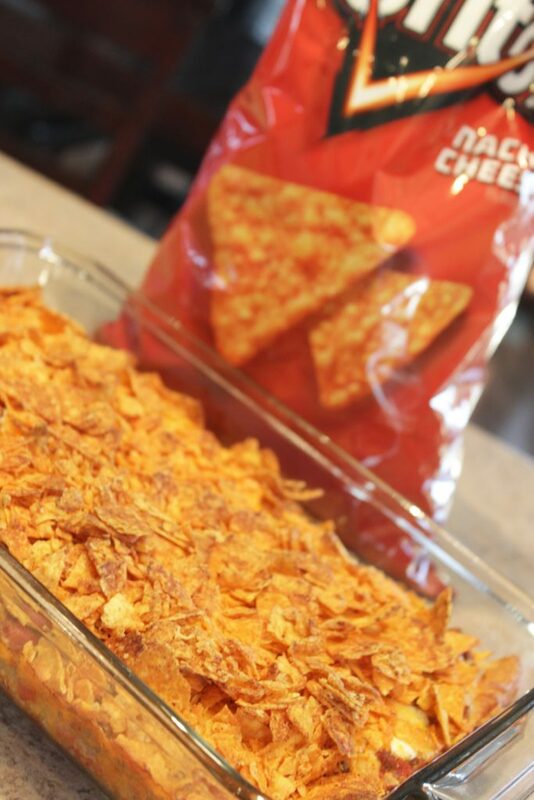 I ended up making Walking Tacos because I was short on time and, well, who doesn’t love a walking taco? I was right, of course they were a hit but as a rule I always make too much meat. And, we’re heading out of town this weekend, so this was the perfect excuse for me to make meals using leftover taco meat this week and get creative. That I did! We have had nachos, of course and taco salads and a few quesadillas sprinkled in as well. My taco bake was a HUGE hit! But, the meal that I just had to write home about (yep, you guessed it, that’s my way of saying put this recipe up on the blog STAT) was this Taco Bake. Everyone from my 40-year old normally picky, “doesn’t like casseroles of any sort” kinda guy, our 9 year old son and our (now) six year old daughter loved it. Like, cleaned their plates loved it. That’s such a good feeling as a mom to know that your family loved your meal, cleaned their plates and hubby will even be willing to take it for lunch to work the next day… major WIN in my book. 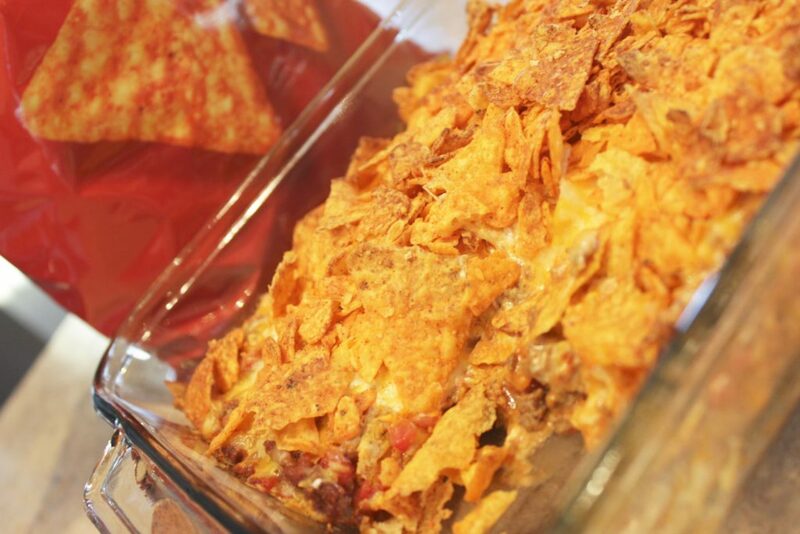 This really is just a taco casserole recipe – but fancier. 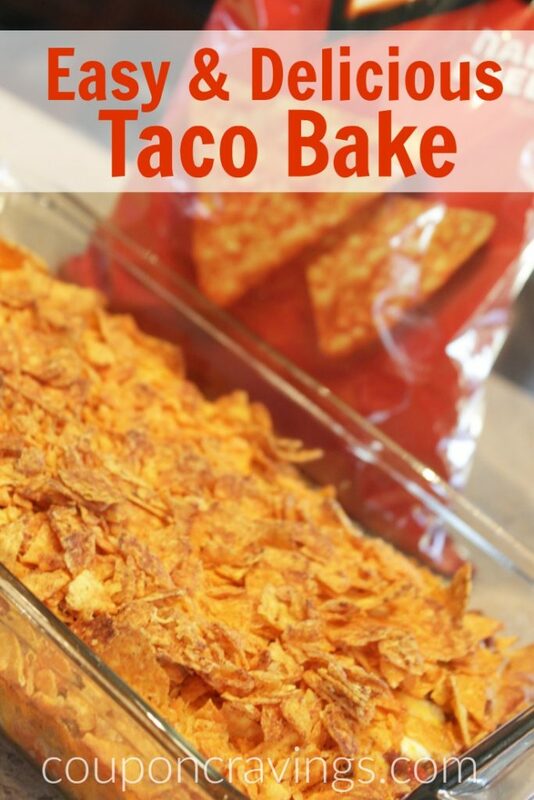 So, calling a spade a spade, this really is a taco casserole recipe. A casserole to me is just layers of ingredients, baked. 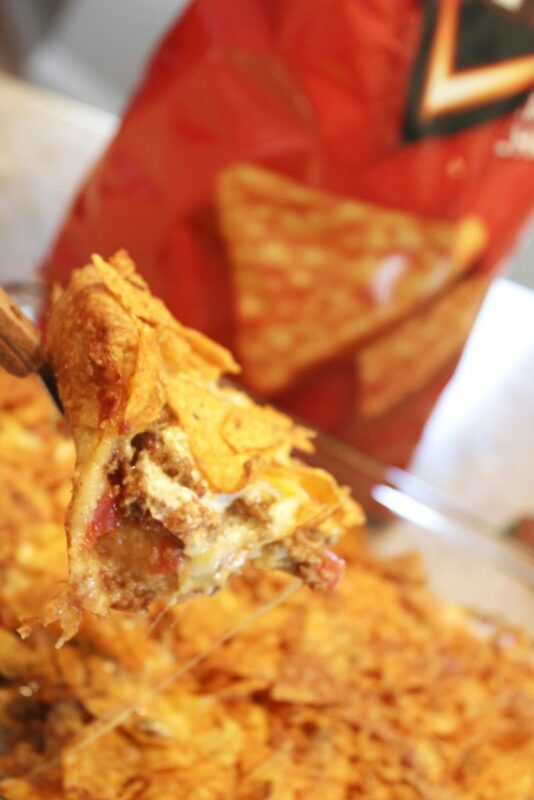 But, since this is a taco bake with crescent rolls, too it kind of has a crust, if you will giving it a taco pizza kind of a feel, which I went nuts over (and *gasp* even had seconds!). I think that this is much like the popular Taco Ring Recipe that we’re seeing all over Pinterest. By the way, have you followed me over there yet — here? You should, there’s lots of awesome pinning going on and some really great recipes to try! Here’s how I whipped this easy dinner up. Make your taco meat like normal. Like I mentioned, I had leftover meat, but I still simmered it with the tomatoes, which I think is actually pretty important to get the flavor that you’re wanting for this taco casserole. If you have picky eaters that won’t eat the tomatoes or will balk at the tomatoes, just use a can of tomato sauce. Spray a 9×13 glass dish like this one here — my FAVORITE, pop open your crescent rolls and lay your crescent rolls in the dish flat. In hindsight, I wish I would have baked just the crescent rolls for 6-8 minutes prior to adding the next layers, but it was still finger licking good. So, do as you wish If you want a “crustier crust” then I recommend baking your crust for a bit. If not, you can’t go wrong either way. 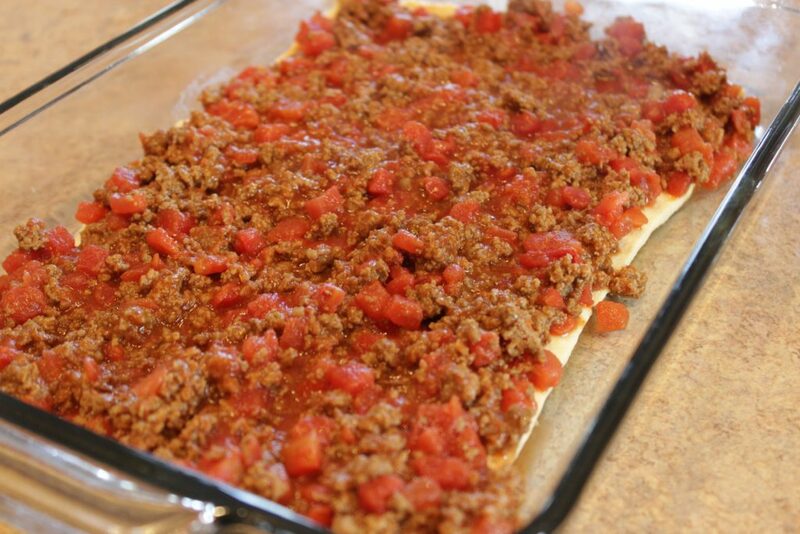 Lay your taco meat and tomato mixture over the crescent rolls, it will be hot, so spreading on your sour cream will be easier. 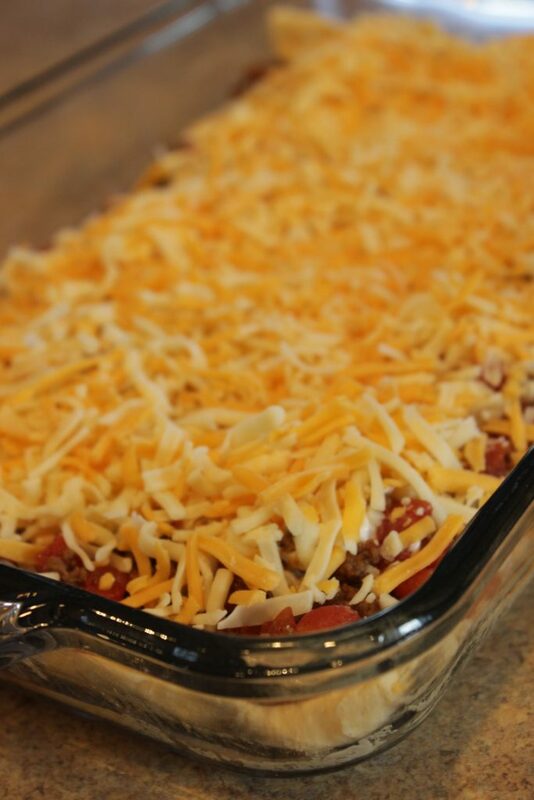 Next, layer your shredded cheese and bake for 15 minutes. See this amazing cheesy goodness? 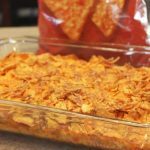 Crinkle up those leftover Doritos — you know, the ones that your kids/husband always leave in the cupboard but they’re not big enough to proudly serve with a sandwich on a plate – yes, those ones. Ha! Layer them on your taco bake and bake for another 15 minutes in the oven. 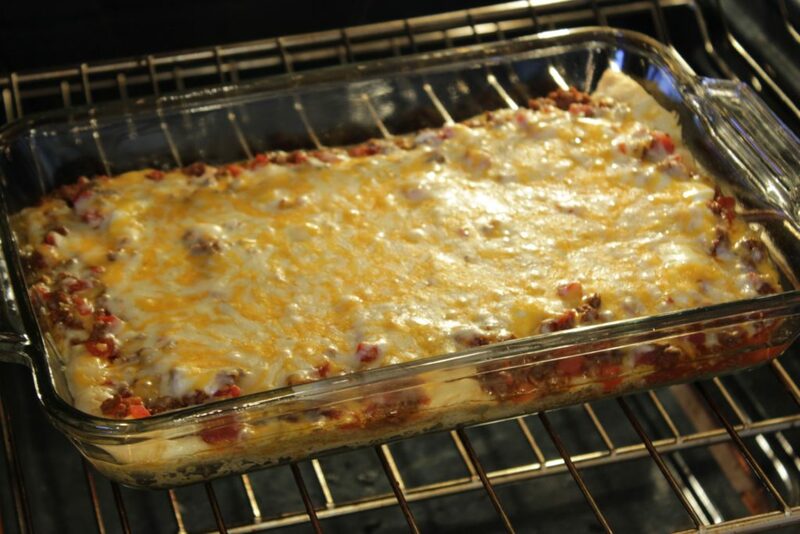 When your taco casserole is done baking, let it sit for about five minutes and cut up to serve. Garnish with lettuce and tomatoes and get ready for your compliments to start rolling in – delicious! Easy dinner idea that the whole family will love! Perfect for leftover taco meat, too! 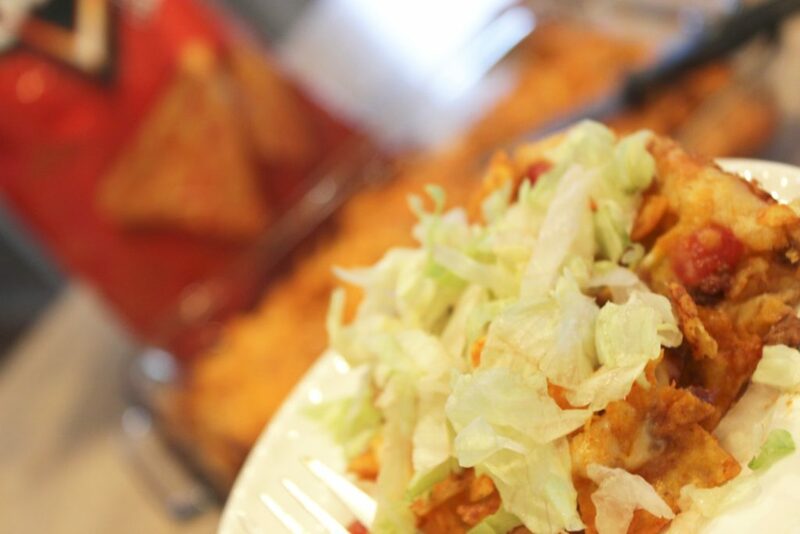 You should try taco lasagna. Omg!! So delish. All my kids love it. This was soooo good! I took your advice and pre-baked the crescent dough for 8 minutes. House smells delicious! Can’t wait to dig in! Hi Melissa! I am so glad you loved it! I need to make it again – it’s one of our favorites! Instead of mixing tomatoes in the meat, I’m think of mixing cheese instead but not alot cause it will have a layer already!! What do you think? Totally personal preference! Sounds delicious, please let me know how it turns out! I make a variation of this. Bake the crescent roll as you do and then let it cool as I make the taco meat and warm refried bean spread the beans on first and add the cooked taco meat mixed with sour cream on top of beans and spread shredded cheddar cheese on top and bake in oven to melt cheese and then add toppings such as tomatoes lettuce sliced olives and onions.